Our daughter is going to a Waldorf School in the East Bay. We heard about Waldorf from a friend of ours who is a teacher, and the more we heard, the more we liked. Ariel is in second grade, and she and we are liking this school and the way it teaches children more and more. It's based on a very rich philosophy called anthroposophy, which I have barely scratched the surface of understanding. An important principle is that you involve the entire being of the child when teaching them - physical, emotional, mental and spiritual. You don't just sit them at a desk and give them homework and tests. As some examples, they have a movement class every week, and their first exposure to times tables is by doing step dances in a circle, emphasizing the two-beat, the three-beat, the four-beat, etc. Note how the circle has the numbers 0 to 9 around it. The way she draws the star is she places her pen at '0', and then says "seven times one is seven" and draws a line to the 7. Then she says "seven times two is fourteen" and draws a line to the 4, and so on. In this way she draws a ten-pointed star, and then she spends time coloring it in to make it beautiful. In the last week she has done this about six times at home, and this is without having any homework assigned. She just loves to do it. Yes, this is a wonderful way to acomplish number literacy. It is a language. Waldorf methods do such a great job at introducing children to the beauty of numbers. Every child loves this type of work. It makes you wonder why public schools do not utilize some of these proven methods. This is beautiful! 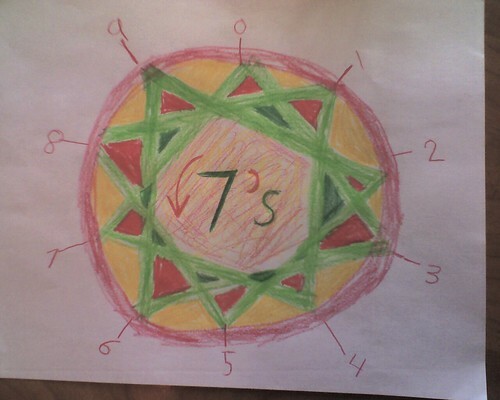 Does your daughter also do this with other sets of math facts, or only the 7s? Could you post pictures of the other types of stars, too? She did many of the other numbers as well. Sorry, I don't have any pictures of these. Open source databases: the looming tsunami?